The Guidotti-Greenspan rule states that a nation's reserves should equal short-term (one-year or less maturity) external (foreign) debt, implying a ratio of reserves-to-short term debt of 1. The rationale is that countries should have enough reserves to resist a massive withdrawal of short term foreign capital. The rule is named after Pablo Guidotti – Argentine former deputy minister of finance – and Alan Greenspan –former chairman of the Federal Reserve Board of the United States. Guidotti first stated the rule in a G-33 seminar in 1999, while Greenspan widely publicized it in a speech at the World Bank (Greenspan, 1999). Guzman Calafell and Padilla del Bosque (2002) found that the ratio of reserves to external debt is a relevant predictor of an external crisis. This is an interesting application of the Greenspan-Guidotti Rule by Porter Stansberry below because it includes the value of the gold at market prices, as well as the oil in the Strategic Petroleum Reserve, and all the foreign reserves on the books of the US against the total foreign debt owed in using the Greenspan-Guidotti rule for its default assessment. Those who argue for a stronger dollar because of deflation due to domestic credit destruction overlook the reality of the yawning imablance of US debt to external creditors, and the need to deal with it without writing it off like a home mortage. What Porter Stansberry says is valid, with the important exception that the US still owns the world's reserve currency. Otherwise it would be well on its way to a hyperinflationary climax. This is why we do not expect the default to be like the Lehman Brothers over-weekend implosion, nor as dramatic as the crisis in Dubai, or more historically the failure of the post-Soviet Russia. The US is too big to fail. 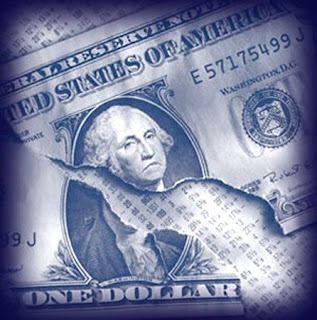 The dollar will devalue to unexpected lows, not with a bang but a whimper. More AIG than Lehman, with high profile big-talking executives, self-serving accounting, bonuses to the perpetrators, de facto bailout and subsidies from frightened central bankers, and all that until the rest of the world can adjust. The US will most likely wallow in stagflation until it can get itself together again, barring a global conflict. There are structural issues for sure. The US is still the consumer of the world's export products, especially manufactured goods. The problem is that they are paying for it with paper that is increasingly worthless. And it is militarily the only remaining superpower. Do not expect this to be a straightfoward default. The US money center banks are wielding weapons of financial mass destruction, and are not afraid of gooning it up in the markets for real products, as they still exercise significant pricing power. The downside of structural change after a long decline is that once it occurs, it is difficult to obtain one's prior reputation and position. "When governments go bankrupt it's called "a default." Currency speculators figured out how to accurately predict when a country would default. Two well-known economists - Alan Greenspan and Pablo Guidotti - published the secret formula in a 1999 academic paper. That's why the formula is called the Greenspan-Guidotti rule. The rule states: To avoid a default, countries should maintain hard currency reserves equal to at least 100% of their short-term foreign debt maturities. The world's largest money management firm, PIMCO, explains the rule this way: "The minimum benchmark of reserves equal to at least 100% of short-term external debt is known as the Greenspan-Guidotti rule. Greenspan-Guidotti is perhaps the single concept of reserve adequacy that has the most adherents and empirical support." So how does America rank on the Greenspan-Guidotti scale? It's a guaranteed default. The U.S. holds gold, oil, and foreign currency in reserve. The U.S. has 8,133.5 metric tonnes of gold (it is the world's largest holder). That's 16,267,000 pounds. At current dollar values, it's worth around $300 billion. The U.S. strategic petroleum reserve shows a current total position of 725 million barrels. At current dollar prices, that's roughly $58 billion worth of oil. And according to the IMF, the U.S. has $136 billion in foreign currency reserves. So altogether... that's around $500 billion of reserves. Our short-term foreign debts are far bigger."